Published on Tuesday, September 18, 2012. This article appears in the October/November 2012 issue of American Craft Magazine. 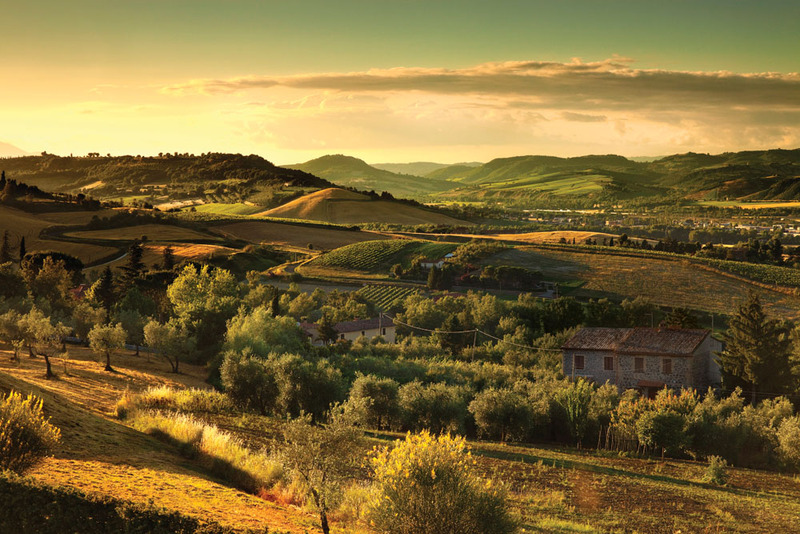 In the Umbria region of central Italy, known for its fertile fields and vineyards, centuries-old craft traditions continue to shine in contemporary work. Whether in a medieval church whose rounded Romanesque forms give way to the heavenward sweep of Gothic arches or in embedded fragments of ancient stone carvings that transform a brick wall into a palimpsest of styles, Italy abounds with traces of craftsmen throughout the centuries building on the old and striving toward the new. This is still true today. 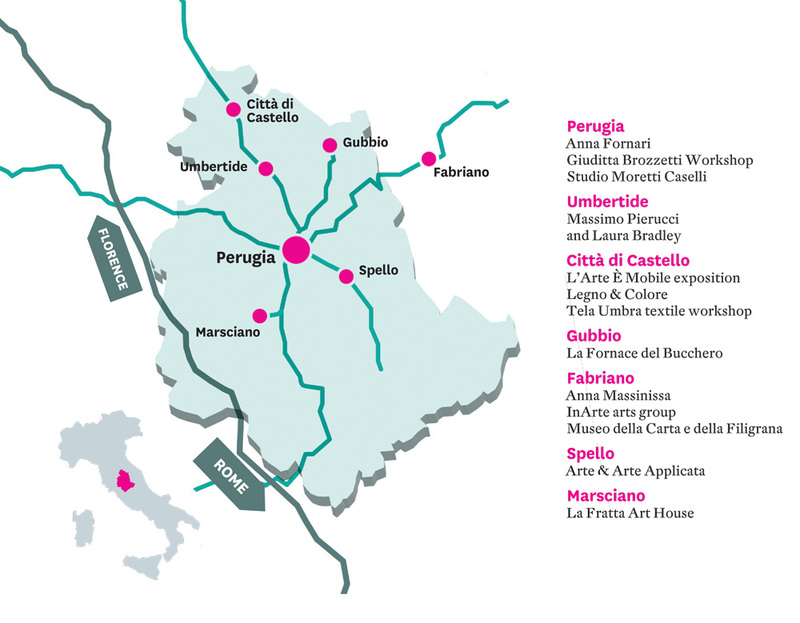 If you make your base the Umbrian capital of Perugia, for example, and draw a triangle north to Città di Castello and east to Fabriano in the Le Marche region, you’ll find contemporary works that combine deep artisanal roots, a sense of history, and an inquisitive spirit. Just south of Perugia, in Deruta, Luca Leandri began throwing pots as a boy, creating majolica wares with colorful grotesques, imagery inherited from the painted grottoes of ancient Roman houses. 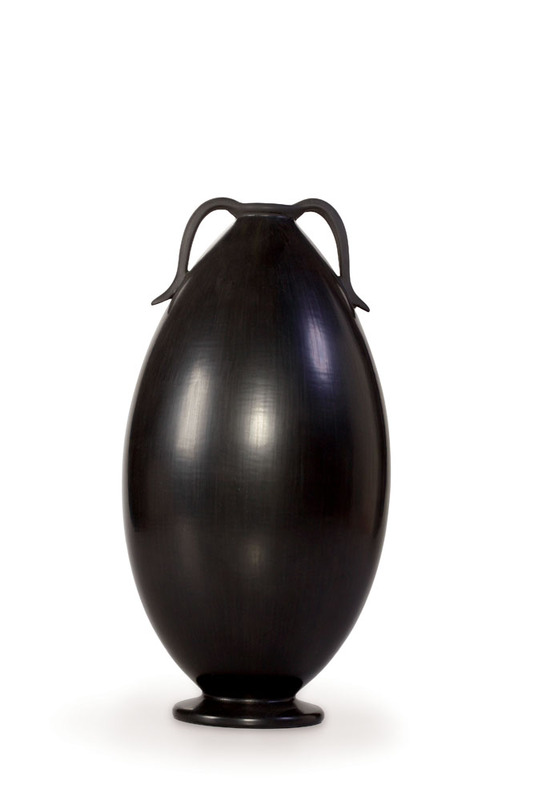 Today, in Marsciano, he fills his farmhouse – dubbed La Fratta Art House – with raku-fired sculptures, monochromatic in hue and existential in tone. “I wanted to pay attention not just to color and technique, but to form and what I wanted to communicate through it,” he says. 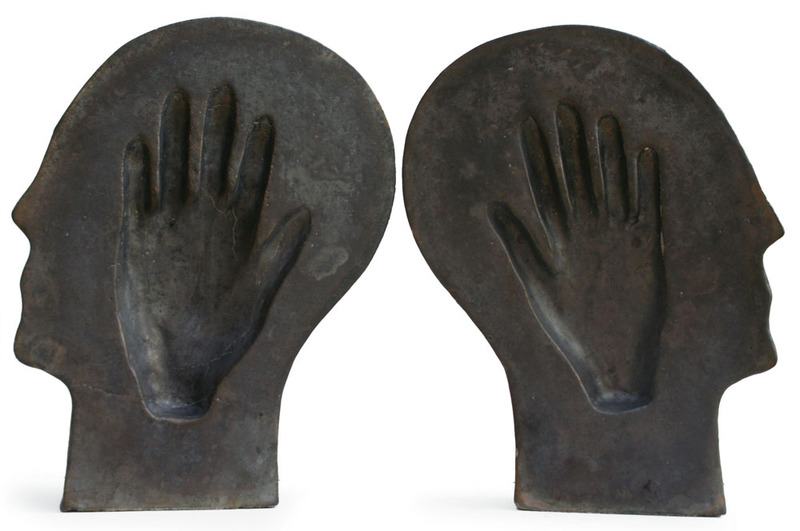 In one series, life-size heads split open to reveal the indented shape of a hand, an ear, a brain. They are a humanist’s answer to ex-votos, the silver plaques worshippers donate to churches as votive offerings. We can thank our own minds for our blessings, the sculptures imply. 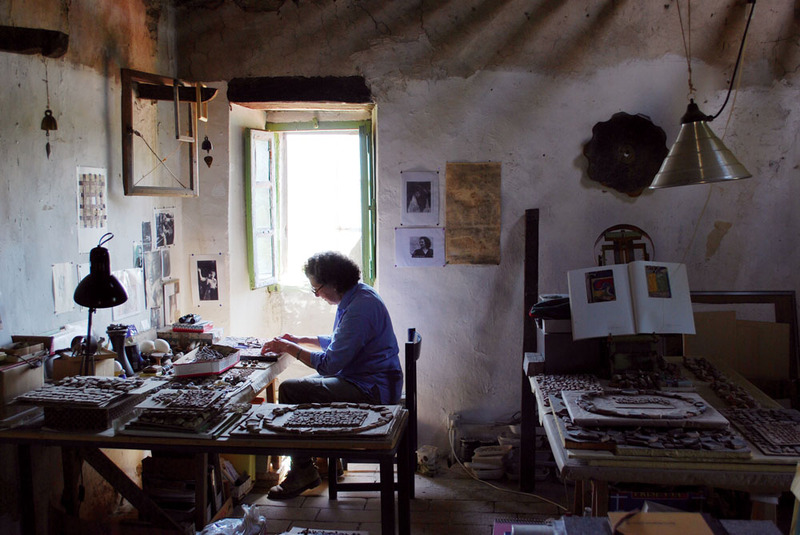 If you’re interested in seeing the kinds of works Leandri started off making, a good place to head for is Gubbio, where family workshops continue the tradition of majolica and bucchero ware, reduction-fired earthenware favored by Etruscans. 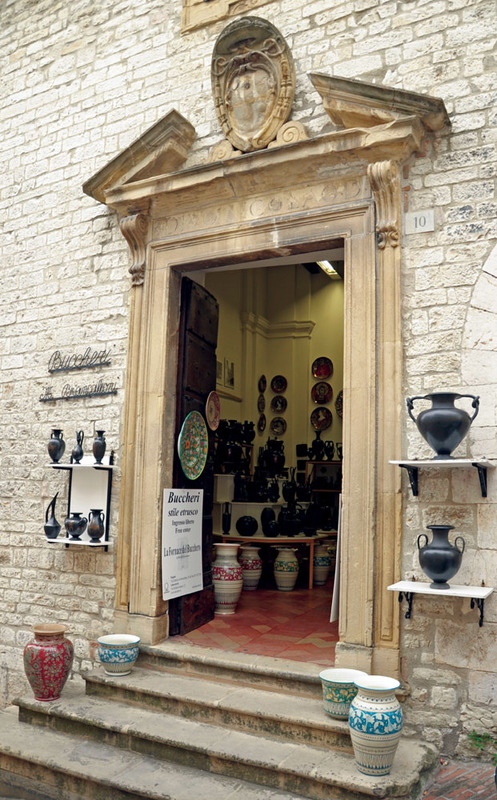 For example, La Fornace del Bucchero is in the 12th- century church where, in the 1920s and ’30s, a Gubbio potter revived the bucchero technique and passed it down to students – among them the mother of current owner Francesco Morelli. “Most of the forms have a historic reference,” Morelli says, pointing to double-handled urns and goblets. But what of the sleek, contemporary forms grouped in the center of the showroom? “It’s nice also to make something more modern,” he answers, smiling. This same spirit animates Arte & Arte Applicata, a gal-lery in the hill town of Spello, famous for its 15th-century frescoes by Pinturicchio. It showcases art jewelers from the region and beyond but reserves the lion’s share of the gallery for works by local artist Angelo Cucciarelli. 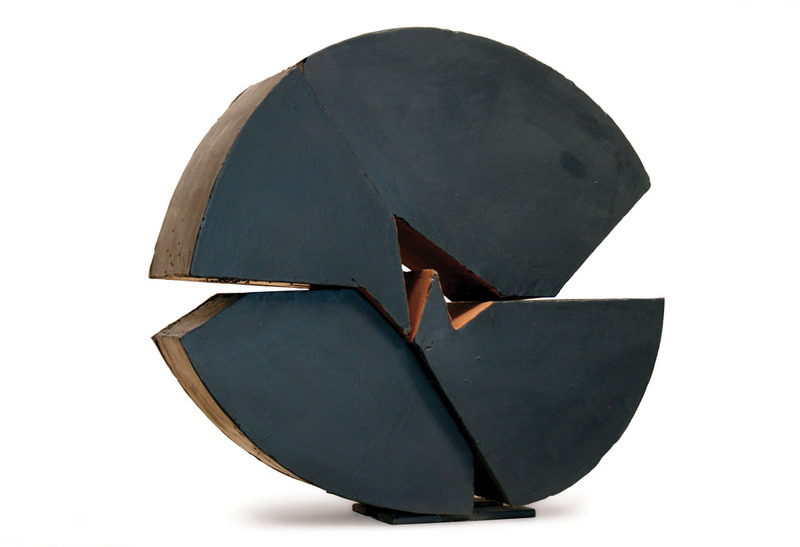 The son of a carpenter, Cucciarelli exploits the tension of interlocking masses in large, architectural sculptures. The gallery recently showed a selection in tandem with the expressive textural works of Perugia textile artist Susanna Cati. Amid the cobblestoned streets of Perugia itself, Anna Fornari employs traditional goldsmithing techniques to investigate puzzling paradoxes. 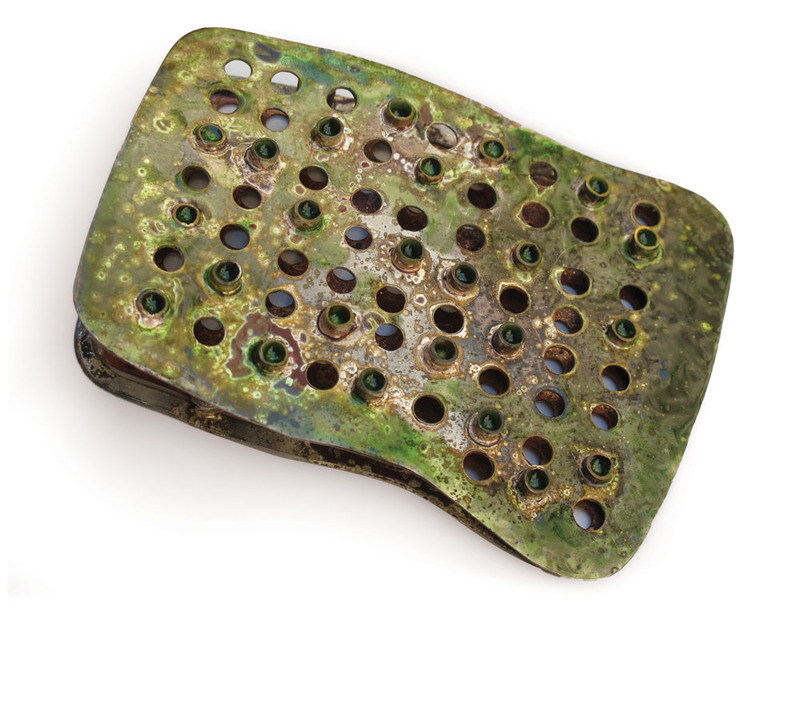 Fornari’s jewelry ranges from playful riffs to thoughtful deliberations on the duality inherent in such forms as ancient seals (matrix/imprint), spoons (cavity/container), and even lowly street grates; yes, effluents slip through them, but sometimes so do treasures. 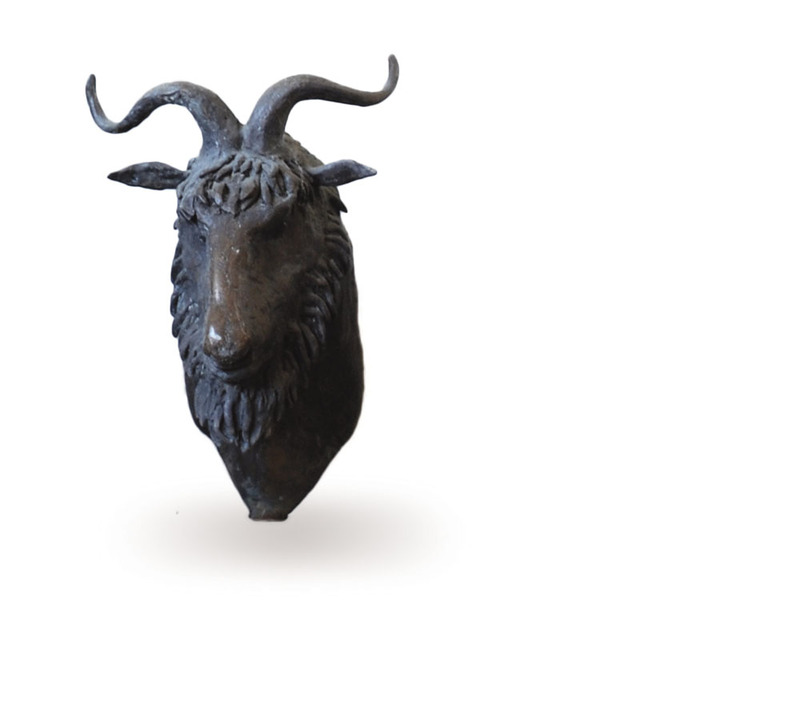 Some 25 miles north, near Umbertide, Massimo Pierucci works in the lost-wax method, casting enchanting bronzes of animals in a furnace he built uphill from a converted 13th-century tower he calls home. A graduate of the Accademia di Belle Arti in Perugia, Pierucci knows he could control the fire better using propane, but he prefers wood. “There’s something romantic about using the old Etruscan technique,” he says. Meanwhile, his wife, Laura Bradley, a U.S. transplant, roams the hills, foraging pottery shards that earlier inhabitants, from Etruscans to contemporary villagers, have left behind in the earth. 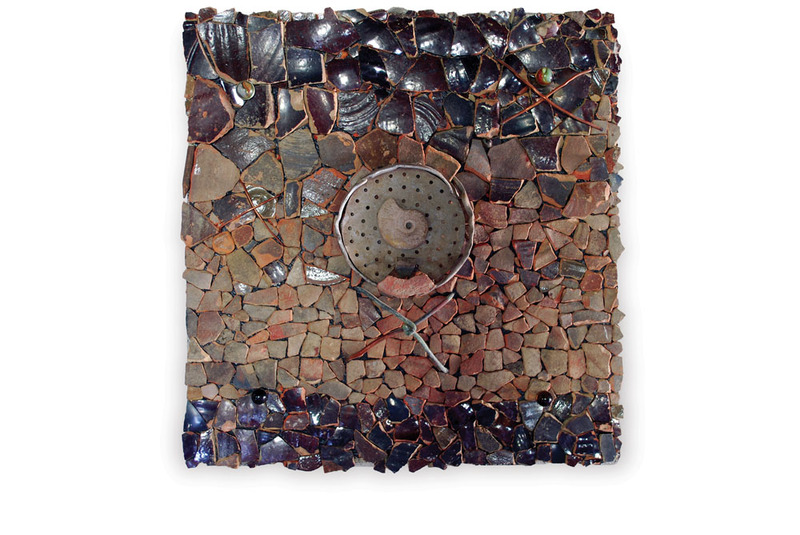 Her upstairs workroom teems with found objects, here grouped by size and type, there coalescing into assemblages that exude reverence for both the material and the components’ original makers. She is earmarking the shards for her Domestic Shields series. Bradley isn’t the only one giving new life to discards. In nearby Città di Castello, the annual L’Arte È Mobile exposition celebrates craft and furniture. 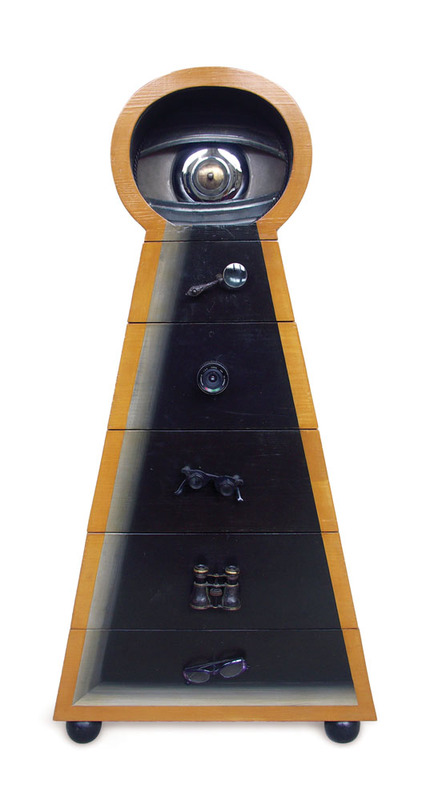 There you will find Legno & Colore (Wood & Color), a family workshop that scours the local dump for objects that suit its members’ imaginative style. Old hardware and vintage buttons are reincarnated as drawer pulls, while everything from teddy bears to metal scraps are assembled into sculptural tops for chests and wardrobes. 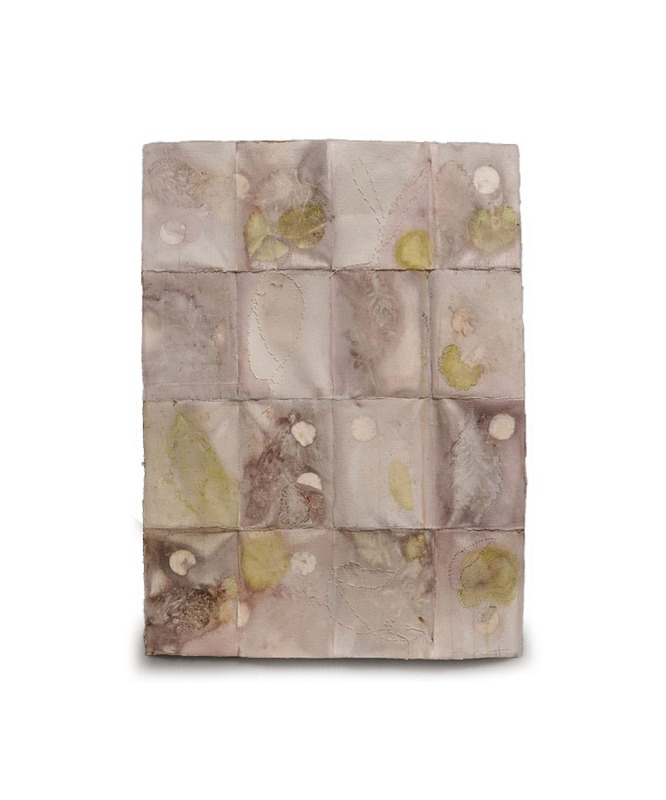 Similarly, over the mountain in Fabriano, Anna Massinissa’s mixed-media pieces often include rescued family linens and handmade paper, a material that has particular resonance here. This is, after all, where craftsmen invented the filigrana – the watermark – in the late 13th century and a half-century later discovered that using gelatin produced stronger, less permeable paper. So Pellegrini asked the museum’s master craftsman, Luigi Mecella, to develop a paper for “Marche d’Acqua,” an international biennial the museum launched in 2010. A jury then asked 34 artists to submit a work using Mecella’s new paper. “Marche d’Acqua” already has had an impact. Mecella, who has been making paper for 26 years, now has students seeking to learn his craft. And the museum is successfully encouraging new, creative uses for its precious paper; this year’s invitees, for example, included American sculptor Brece Honeycutt. With the biennial, the museum is building a collection it hopes will put Fabriano on the map for artists and art lovers, and deservedly so, for Fabriano is also home to InArte, a socially minded arts group Massinissa founded. It organizes year-round events and runs an exhibition space to showcase members such as Franco Zingaretti, who once worked in the Fabriano paper company and now creates lively, playful collages and sculptures that often incorporate paper. If artists today can use ancient crafts to engage with new ideas, it is because the designs and techniques of their forebears live on. In Perugia, Maddalena Forenza carries on her family’s tradition at their 150-year-old workshop, Studio Moretti Caselli, making stained-glass windows. On the city’s outskirts, the Giuditta Brozzetti Workshop, founded in 1921, continues to produce a wide range of textiles using handweaving techniques dating back to the Renaissance. The workshop’s deconsecrated 13th-century Church of San Francesco delle Donne promises an ideal setting for seeing wooden jacquard looms in action. Similarly, the Tela Umbra textile workshop has been producing Umbrian textiles since 1908. Located in the historic Palazzo Alberti Tomassini, just steps from Città di Castello’s main square, the workshop continues to make signature indigo-and-white Perugia towels. 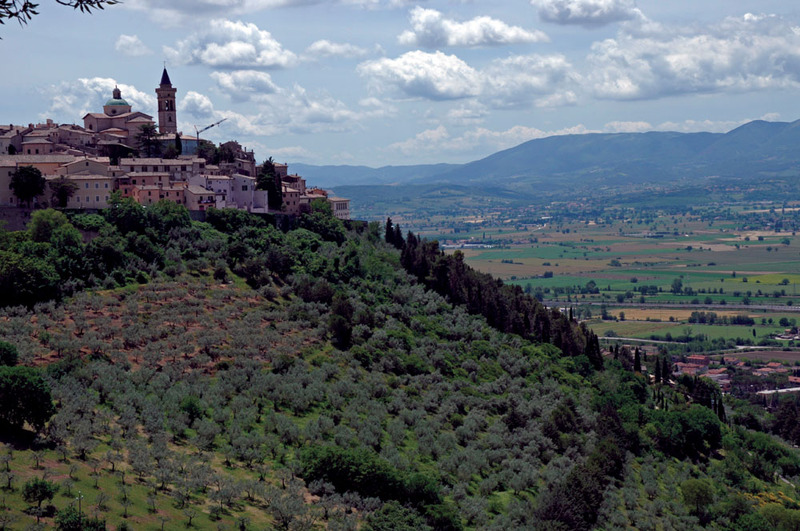 And for lovers of ceramics, Gubbio offers a number of workshops making colorful majolica wares and elegant black bucchero vessels. For a small town, Fabriano has played a huge role in the history of papermaking. It was here that medieval master craftsmen revolutionized papermaking by introducing hydraulic mills to break down rags into pulp faster and more effectively than the trip-hammers and mortars others were using. 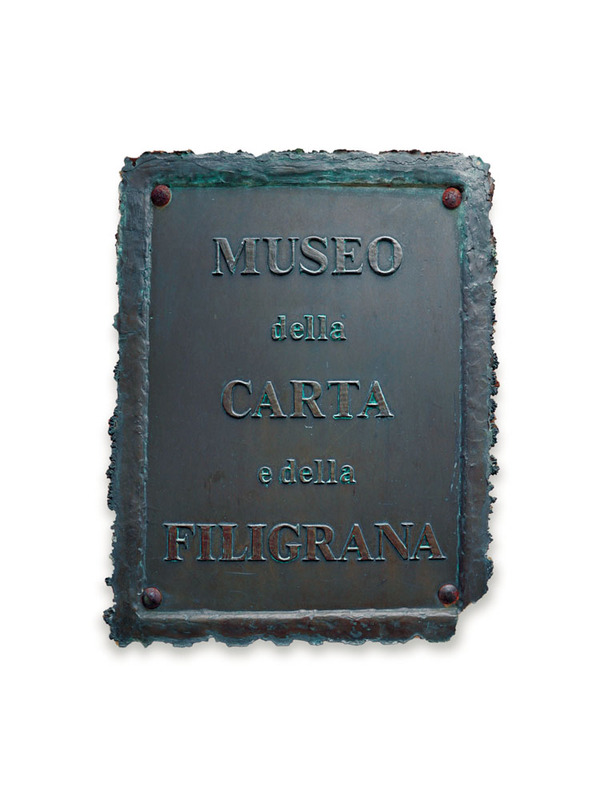 Soon competing mills sprang up, and craftsmen needed to mark their product – so, according to many accounts, the cartai – papermakers – of Fabriano invented the watermark around 1280. There was another significant improvement: They substituted gelatin for starch, making their paper less permeable and better suited to Europe’s humid climate. Lee Lawrence is a Brooklyn-based freelance writer whose work has been published in the Wall Street Journal, the New York Times, and Art & Auction.